For those of us working in academic institutions, it is that time of the year again – when students return from their vacations, or their internships, or just hanging about, or vegging out at home. A time of excitement, especially for the ones just starting, and a little apprehension too, on so many fronts. Yet are copies of prescribed or recommended books available outside the schools? Again I doubt.. Even in secondary schools where the numbers are not so great, I have yet to hear of students being supplied with books. All too often lists are sent home, and parents are asked to make sure that children/wards have them. Some of these are available, as are many study guides, or sets of practice examination questions – as if passing exams is the only reason for attending secondary education? But where I work is different – it is tertiary, and unlike many other institutions that I know of here, it supplies students with textbooks. Ashesi University College usually provides each student with one text per semester course. These are loaned to students, and then returned so a succeeding year may make use of them. Lack of learning materials therefore can’t be used as an excuse for not learning, or for hoarding a book from an institution library or massive photocopying – at least in theory. So this week my colleagues and I have spent many hours giving out texts, to help new and old students on their learning paths. Some complain that the books are heavy. True. But how would they feel if they didn’t have any? Do they realise that their colleagues in some universities have to buy books themselves, and even that can be hit and miss, as the bookshops rarely have huge numbers of these in stock? 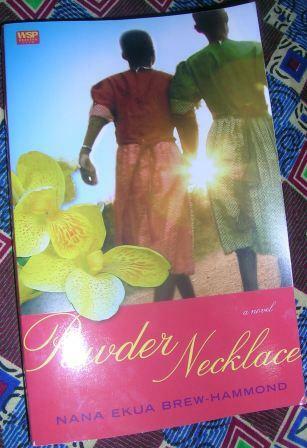 Last Thursday I went to the launch of Nana Ekua Brew Hammond’s first novel, Powder necklace, at the Silverbird bookshop at the Accra Mall. It was very much a family event – with the MC being the author’s father and the one introducing the author, her mother, plus I suspect there were quite a few other extended family members present. What I found interesting was the ostensible reason for the author’s presence in Ghana. She attended Mfantsiman Girls Secondary School, and was around to join other colleagues in celebrating the school’s 50th anniversary. There were several “old girls” present – those that introduced themselves were however all resident outside Ghana, as opposed to those living here, which did raise some questions in my mind. Indeed those of us who bid for the ten auctioned books were told that part of the money raised would benefit Mfantsiman, which was OK with me. Otherwise I would have had to wait to buy a copy whenever they appeared. I still may do so, because I wonder whether some members of my own family would find that there are echoes of their own experience at secondary schools in Cape Coast during the last part of the 20th century. For this post, the key role of these associations in the development of many schools remains: providing libraries, computers, labs, transport, websites and even housing – among many others. Another significant contribution on the part of the non-public sector to the education here in Ghana. Education: a view from Ghana – Do libraries really play a role? Virtually all my working life has been in libraries – or closely associated with them: academic, special, public, cultural, and now academic – if you want to “typecast” them! And all in West Africa – Nigeria, then Ghana. I admit that I have not worked in school libraries, though quite a lot of the work I did while at the Ghana Library Board involved liaising with basic schools and key local players in the education sector, and this was during some of the worst economic times in Ghana’s history. What was the impact of what my colleagues and I did? To be frank, I don’t know. We really didn’t measure what we did, except to record traditional library statistics of books borrowed, and membership. Has the situation changed since I left? I would hope so, but I frankly admit I don’t know. It seems to me that “libraries” are considered a “good” thing here in Ghana, at least from the point of view of politicians and the media. That is, of course, when they decide to think about them and/or talk about them – which is not very often, in my opinion. Certainly it seems that the word “libraries” is coming up a bit more frequently in the state owned press – at least as far as my personal impression is concerned. But has this translated into anything more than lip service? The Ghana Library Board has been in existence for more than sixty years, and it is certainly the major set of libraries serving the needs of the general public in Ghana. But how many people even know of its existence, let alone use it? I suspect that the vast majority of users are either children in basic education, or older secondary level students studying during holidays or for remedial classes. Of course I could be wrong. So yes, it does support education at some stages at least for some people. But are those who don’t patronize libraries any less educated? As for the community libraries, I would imagine it depends on the outreach that is done by those who running these facilities, plus the commitment that the originators have to their continued usage. With the exception of a few that I have heard of – the Kathy Knowles Libraries in Nima and elsewhere in Accra and Friends of African Village Libraries in the Upper East of Ghana come to mind. In these libraries there are literacy classes, reading camps, drama and music groups, among a range of activities going on. There are stories of success, but who has heard of them? Does anyone shout: “I owe part of my success at school/college/university due to my reading and using the library”? These are all positive, are they not? But again I ask myself, and others, what is the impact of all this activity? And is it measured? And who cares anyway? 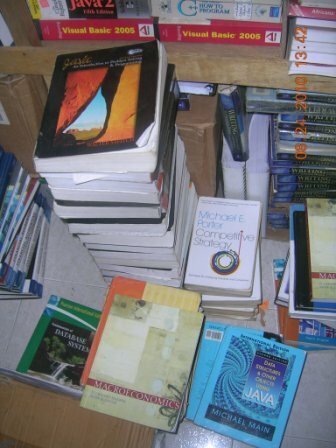 A colleague recently wrote about a Reading revolution and how to encourage more reading among Ghanaians. Her ideas are definitely out of the box – at least for Ghana, and all the more appealing because they are different from what usually comes up. At work, we are about to launch a campus-wide reading campaign – admittedly part of a general communications strategy to improve the quality of student language skills and general literacy – whether spoken or written. This will be partly through exposure to pieces of writing which are recognized for their quality in terms of content, theme and how English is used. The first choice is not surprisingly a novel by a Ghanaian author. Selection was not as straightforward as it might have been, as the pull of older Ghanaian authors such as Ama Ata Aidoo is strong. But in the end the decision was to opt for something a bit more contemporary, which is how we finally chose The clothes of nakedness, by Benjamin Kwakye. 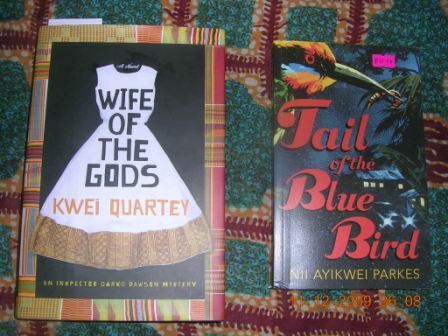 Fortunately for us, local bookseller EPP seems to have the rights to republish quite a few of the African Writers Series, so we were able to easily buy enough copies for all members of our academic community. Certainly the news seems to have got out. Students, faculty and staff have all been coming in to the library for their copies. Will it be read? We shall see. It will be an experiment worth watching. I was aware that the Burt Award for African literature 2009 was going to be officially announced on 4 August here in Accra, at the Ghana Book Trust, but didn’t go to the function. However, this morning, I see that Nana Fredua-Agyeman at ImageNations has already blogged about it. Once again, nothing in the news part of the main state-owned press so far, but Ghanaian Times did have two adverts related to the award in the 5 August edition. One was an invitation to publishers to tender, but the other was actually more in the form of a press release. There is a copy of the “Announcement of winners” on the GLA website. If I find more stories on the web related to these awards, I will put up the links.